Have you heard of the Chinese five elements theory? In traditional Chinese medicine, five elements of nature (wood, fire, earth, metal and water) represent different attributes of human health. Ideally we should have a balance of all five, but most of us are predisposed toward one element in excess of the others, causing an imbalance in the body with negative physical manifestations. Check out this quiz to determine what element is most prevalent for you, and then read about your element’s characteristics and how to help yourself get back into balance. A few months ago, my latest step in my journey to heal myself naturally of the curious skin rashes that seem to come and go, brought me to a new health practitioner: an acupuncturist and doctor of traditional Chinese medicine (TCM) who assessed me based on the Chinese five elements theory. She asked me a few questions, looked at my tongue, eyes, and overall frame, then said my elemental type was Metal. She said that my big problem is that the pH balance in my body is off, and leaning too far in the direction of acidity. Don’t know much about pH balance and the acid-alkaline balance in the body? Check out this nice little article to learn more, and then come on back to me and read on. Surprisingly, one of the ways this over-acidity was manifesting, she said, was that my stomach contained too little digestive acid to properly digest my food. As such, I wasn’t getting enough nutrition from the foods I eat because my stomach wasn’t able to break everything down as it should. She also said to make broth to extract the nutrients of various foods into a form that can be consumed without digestion from the stomach. According to her assessment, I lack the requisite amounts of stomach acid to properly digest certain foods. I sat up straighter when she said this, because I already make a ton of broth and drink it every day, sometimes in the morning in a mug instead of coffee or tea. You’re probably thinking to yourself Yes, yes Ecomama, this is all fine and good, five elements, mm hmm, interesting, but what about the coconut cream you mentioned in your title? Well, the new diet means I’m now I’m officially dairy-free, and even though I didn’t eat a lot of dairy before, butter remains one of my true gustatory pleasures. Eliminating butter is, for me, the most excruciating part of giving up dairy. I don’t drink milk, I hardly eat cheese, I’ve gotten over the loss of yogurt, but oh … butter. How I miss you so. Needless to say, since this diagnosis, I’ve been exploring lots of non-dairy alternatives to dairy foods. I tried some almond cheese that didn’t exactly taste like cheddar as the wrapper implied, but it melted well enough in a quesadilla to suit me. I already make my own rice milk and almond milk, but there are certain recipes calling for cow’s milk, like my favorite healthy pancake/waffle batter or creamy oatmeal cooked on the stove, that need a little more fat to give them the fluffiness or richness they need. One morning, as I was getting my ingredients out to make steel cut oatmeal on the stove, I found myself completely out of both rice and almond milk. I rifled through the pantry and spotted a can of coconut milk that had been waiting to be transformed into an amazing Thai curry dish that never quite materialized. I dumped it all in a small storage container. The liquid poured out easily, and then I scraped out the thick solids that had risen to the top of the can and stuck to the lid. I topped the storage container with its own lid and with one hand, shook the container intensely to break up the solids and mix them into the liquid. With the other hand, I licked the silicone spoon I had used to scrape the can clean. As soon as I licked, I had the flash realization that the texture of that coconut “cream” was very similar to butter, my long lost love! Be still my beating heart! I immediately stopped shaking, but alas, the solids were already all mixed in. I vowed I wouldn’t shake the next can I opened, so that I could keep the buttery coconut cream intact. Fast forward a couple of days, and another can of coconut milk was purchased and opened. This time, I didn’t mix the solids in with the liquid, but rather left it all separate. 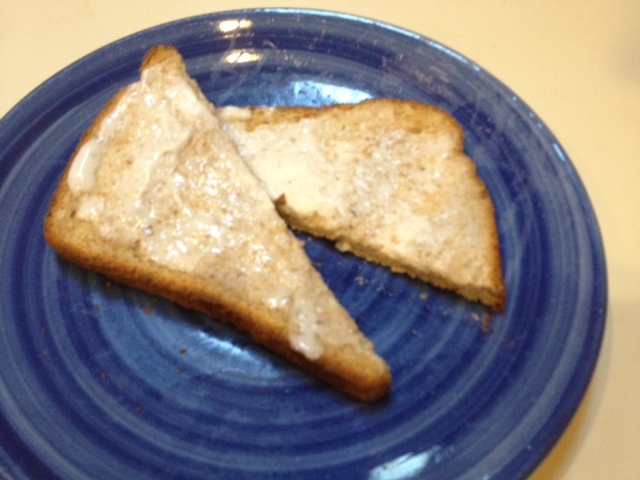 I toasted some whole wheat bread, and spread the coconut cream on it like butter. I swear it spread the same way, glistened the same way, even melted slowly into the bread the same way. I sprinkled it with a generous pinch of sea salt, and while it didn’t taste exactly like butter, the fatty creaminess did hit the spot juuuuuust right. Thank you, coconut cream. You have saved me from plummeting to the dangerous depths of severe butter withdrawal. Since Ecobaby was born, my immune system just hasn’t been the same. I appear to be plagued by a variety of autoimmune disorders that manifest with a variety of symptoms that are entirely new to me. I hate to say that cold sore outbreaks are among the list of unpleasantries. Throughout my life, I had occasionally gotten what I referred to as an “itchy bump” on my lip, but it never turned into anything more. I’d chew on it a bit to relieve the itch, it would get all big and puffy that day, and then it would shrink down and disappear overnight. After a horrible case of strep throat last year that left my weak immune system even weaker, now when I get an itchy bump on my lip, it is the precursor to something much worse. It starts as a burning, raw, chapped feeling, and is usually preceded by a lot of time in the sun without protecting my lips, more stress than usual, and not drinking enough water. Then, the itchy bump appears, grows, and slowly turns into a blister. The blister grows and ultimately erupts, oozing contagion and forcing me to wash my hands like a hospital employee, and endlessly dab, dab, dab with tissues. Worse still, it forces me to avoid kissing my precious Ecofamily til it clears up. A misguided attempt last year to treat a cold sore topically with tea tree oil (combined with the lack of knowledge that the oozing sore is VERY contagious) resulted in my entire upper lip reinfecting itself and crusting over for nearly two weeks. Ecobaby was just a few months old, and it was absolute torture not to be able to kiss her. I consulted my holistic parenting group for natural remedies, and I kept getting the same answer over and over again. Before we talk about the amino acid L-lysine, which is naturally present in the body, let’s briefly touch on another amino acid, L-arginine. An abundance of L-arginine in the body creates a hospitable environment for the herpes simplex virus (ie, cold sores) to run rampant. Foods that are naturally high in L-arginine include chocolate (guilty) and nuts (guilty again). L-lysine on the other hand represses the metabolism of L-arginine. Dairy products are very high in L-lysine, and I didn’t eat any for a year, and still don’t eat much of it now. In high enough doses, L-lysine reverses the visible symptom of cold sores. I began my attack with 1000 milligrams of L-lysine every few hours that night, and all day the next day. By the second night, it had already started drying up and shrinking. When I woke up the next morning, the top layer had dried up and fallen off, and I was on my way to a normal looking lip once again. Now when I get an itchy bump on my lip, and recognize those other signs like tingly lips, too much sun, not enough water, etc., I immediately start taking loads of L-lysine. Bump never materializes into anything more, and is usually entirely gone the next day. L-lysine. Stops cold sores in their tracks. Remember those ceramic statues in the seventies shaped like animals or a human head that you’d cover with a fine layer of tiny black seeds and water daily? Sprouts would grow, making it like fur or a really tight ‘fro. Chia seeds provide super-high levels of omega-3 fatty acids, which are crucial for brain development. Omega-3’s are also linked to joint health as well as elevated mood; one Scandinavian study showed that people taking an omega-3 supplement for four months reported happier outlooks on life. Eating seeds can make you happier. Who knew! The little black seeds can hold 8-10x their weight in water, making a gelatinous substance that can be used in many different ways. It can substitute for eggs in various recipes, baking or otherwise. I also add it to foods where my three year old won’t notice, like pasta sauce or scrambled eggs, as well as putting it in Ecodaddy’s morning smoothie. The seeds don’t really have a particular flavor, so they are very easy to camouflage. Place seeds and water in container and seal lid. Shake vigorously for a few seconds. Let rest for a few minutes, then shake again. Gel should be ready in ten minutes. Refrigerate and use for up to two weeks. 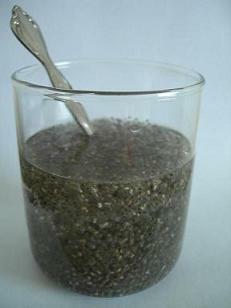 If you want to use your gel as a substitute for eggs in recipes, the general rule of thumb is 1/3 cup chia gel per egg. I do this often in baking recipes, and neither Ecodaddy nor the Ecokids ever know the difference. It’ll be our happy little secret. Ecobaby has been drooling up a storm. Her fist has been in her mouth at every possible opportunity. She’s been chewing on my fingers and knuckles every chance she gets. Not even four months old, she has only been grabbing at things with her hands for a few weeks now. She can direct objects to her mouth, but struggles to keep them there, so she has been getting very frustrated. Normally, she sleeps through the night, from around 9:30pm until 5:30 or 6am (I know, I know, it is truly miraculous! ), but last night, she woke up three separate times throughout the night. Only three? some moms might be muttering to themselves. To them I offer a deep bow of admiration for trudging through each day under the effects of extreme sleep deprivation. You are unsung heroes, mamas! Anyway, combining all these different clues … the drooling, the fist sucking, the night-waking … I’ve concluded that she must be teething. Or pre-teething. Whatever you want to call it, something is going on in her mouth that’s causing her discomfort and disruption of the usual program. 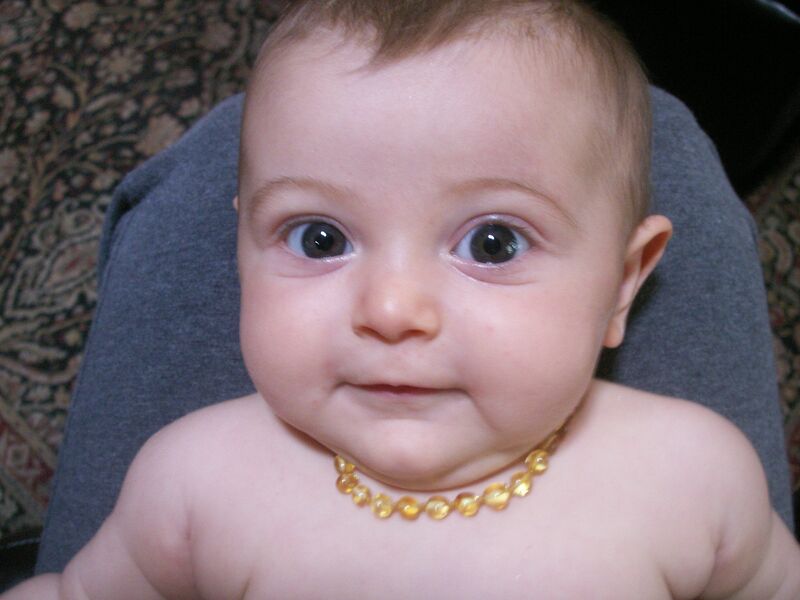 Having identified teething as the culprit, out came the baltic amber necklace from big sister’s jewelry box. At age 2.75, Ecogirl won’t have any new teeth coming in for a while, so her necklace can be handed down to Ecobaby for now. Baltic amber is a fossil resin from ancient pine trees. It contains large amounts of succinic acid, a powerful anti-oxidant that has been shown to boost the immune system. Succinic acid helps restore strength and energy, enhances brain function, and reduces stress. It is also a natural analgesic and exhibits both anti-inflammatory and antibiotic properties. Baltic amber necklaces have been used for centuries to treat many different ailments. When the necklace is in direct contact with warm skin, succinic acid is released and absorbed through the skin into the bloodstream. But how can a baby wear a beaded necklace, you might ask? Won’t she pull on it and break it, sending beads everywhere? The necklaces are strung by hand one bead at a time, with a knot in between each bead. If your child pulls on the necklace and it breaks, only one bead will be lost instead of a whole necklace worth of beads scattering all over the place. The necklace will still be shot, but it will pose significantly less potential hazard to your little one. You can leave the necklace on all the time, though some people like to remove it at night for fear their child will get tangled and strangled. Ecobaby is a veritable mummy when she sleeps; she doesn’t move an inch, so I feel comfortable leaving it on. You do want to remove it when bathing, however. Soap buildup can create a barrier between the bead and the skin, preventing the succinic acid from entering the body. To keep the necklace clean, just wipe with a damp cloth from time to time. If you have a child who is teething and you are a skeptic: just try it. At best, your child gets relief, which means you get relief. At worst, your child looks really darned cute. I am Ecomama: former NYC businesswoman reincarnated as an earthy mom, yoga instructor and nutrition and health coach. I love fun, healthy projects in the kitchen. I love my kids. I love the earth. And I've got a lot to say about all of it!